At Google, we’re obsessed with building energy efficient data centers that enable cloud computing. Besides helping you be more productive, cloud-based services like Google Apps can reduce energy use, lower carbon emissions and save you money in the process. Last year, we crunched the numbers and found that Gmail is up to 80 times more energy-efficient than running traditional in-house email. We’ve sharpened our pencils again to see how Google Apps as a whole—documents, spreadsheets, email and other applications—stacks up against the standard model of locally hosted services. Our results show that a typical organization can achieve energy savings of about 65-85% by migrating to Google Apps. Lower energy use results in less carbon pollution and more energy saved for organizations. That’s what happened at the U.S. General Services Administration (GSA), which recently switched its 17,000 users to Google Apps for Government. We found that the GSA was able to reduce server energy consumption by nearly 90% and carbon emissions by 85%. That means the GSA will save an estimated $285,000 annually on energy costs alone, a 93% cost reduction. A typical organization has a lot more servers than it needs—for backup, failures and spikes in demand for computing. Cloud-based service providers like Google aggregate demand across thousands of people, substantially increasing how much servers are utilized. And our data centers use equipment and software specially designed to minimize energy use. The cloud can do the same work much more efficiently than locally hosted servers. We’ve built efficient data centers all over the world, even designing them in ways that make the best use of the natural environment, and we continue working to improve their performance. We think using the super-efficient cloud to deliver services like Google Apps can be part of the solution towards a more energy efficient future. The YouTube Player: Now with 30% More Playlistiness! When Youtube launched support for lists of videos in the YouTube player in March, it was greeted with a lot of enthusiasm. However, some developers pointed out that at first glance it didn’t look very much like a playlist. In particular, they wanted the list of video thumbnails to be visible all the time. To see all of the parameters that the YouTube player supports, refer to the documentation. If you have any questions, feel free to post them to the YouTube API Google Group. Posted on June 17, 2012 Author Steven WallCategories Featured, YouTubeTags YouTube PlayerLeave a comment on The YouTube Player: Now with 30% More Playlistiness! All of you haiku fans (like many of us on the Chrome team) can stop here; the rest can read on for more details. A year ago we introduced a new model of computing with the launch of Chromebooks. We’ve heard from many of you who’ve enjoyed the speed, simplicity and security of your Chromebooks at home, at school or at work. (Thanks for all the wonderful feedback and stories!) Today, we wanted to share some developments with you—new hardware, a major software update and many more robust apps—as we continue on our journey to make computers much better. 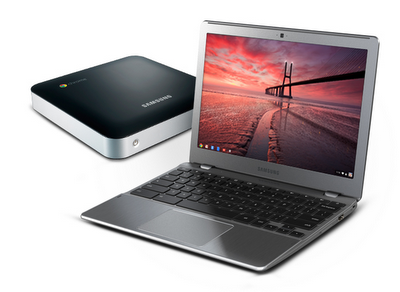 Our partner Samsung has just announced a new Chromebook and the industry’s first Chromebox. Like its predecessor, the newest Chromebook is a fast and portable laptop for everyday users. The Chromebox is a compact, powerful and versatile desktop perfect for the home or office. Speed is integral to the Chrome experience. The new Chromebook and Chromebox, based on Intel Core processors, are nearly three times as fast as the first-generation Chromebooks. And support for hardware-accelerated graphics, a built-from-scratch multi-touch trackpad and an open-source firmware stack provide a much faster and more responsive computing experience. The new Chromebook boots in less than seven seconds and resumes instantly. With the Chromebox, you can be on a video conference while continuing to play your favorite role-playing game on the side. With the new user interface you can easily find and launch apps, and use them alongside your browser or other apps. You can pin commonly-used apps for quick access, display multiple windows side-by-side or experience your favorite apps in full-screen mode without any distractions. Get more stuff done, online or offline: With the built-in ability to view Microsoft Office files and dozens of the most common file formats, you can access all your content without the hassle of installing additional software. Google Drive makes it easy to create, store and share with just one click. Drive will be seamlessly integrated with the File Manager and support offline access with the next release of Chrome OS in six weeks. With Google Docs offline support (rolling out over the next few weeks), you can keep working on your documents even when offline and seamlessly sync back up when you re-connect. 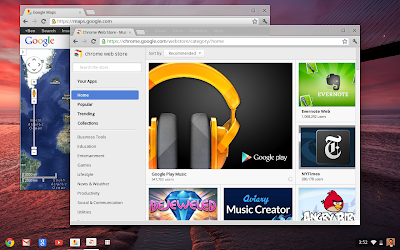 In addition, there are hundreds of offline-capable web apps in the Chrome Web Store. Have more fun: The revamped media player and a built-in photo editor and uploader enable you to easily play and manage your personal media collections. Through the Chrome Web Store, you can access entertainment apps such as Google Play, Netflix, Kindle Cloud Reader and Pandora, and thousands of games including popular games like Angry Birds and console titles such as Bastion. Carry your other computers…inside your Chromebook: With Chrome Remote Desktop Beta, you can now securely connect to your PC or Mac from your Chromebook or Chromebox. With the underlying VP8 technology, it’s almost like you’re in front of your other computers in real time. We’ve released eight stable updates over the past year, adding a number of major features and hundreds of improvements to all Chromebooks through our seamless auto-update mechanism. There’s a lot more on the way, so all you need to do is sit back and enjoy the benefits of the (always) new computer. For those who want to try the Chromebook and Chromebox first-hand, we’re expanding the Chrome Zone experience centers. In the U.S., Chromebooks will be available to try out in select Best Buy stores in the coming weeks. In the U.K., they’re now available in a growing list of PC World and Currys stores. Starting today, you can get the new Chromebook and Chromebox from our online retail partners in the U.S. and U.K., and in other select countries over the coming weeks. Online shopping is great for many reasons, but most of all it’s a convenient and fast way to turn your intent to buy that new pair of running shoes, for example, into an actual purchase. But shoppers tell us they’re often nervous about buying from online stores they don’t know. We created the free Google Trusted Stores program to help solve this problem. When shoppers see the Google Trusted Store badge, they know in a snap they’re shopping with a reputable retailer and they can feel confident making an informed purchase. We’ve been testing the program since last fall with about 50 online merchants and more than 10 million orders. It’s working even better than we hoped, generating positive feedback from shoppers and increasing sales for merchants. Starting today, Google Trusted Stores is open to all U.S. merchants who want to apply. When shopping online, you may come across the Google Trusted Store badge. Hover over it and you’ll see a “report card” which shows “grades” for that merchant’s shipping and service, including more precise metrics about what the grades mean. This badge is only awarded to online stores that deliver a great overall experience, so even if you haven’t shopped with this merchant before, you can easily tell if they are trustworthy, ship quickly and reliably, and offer exceptional customer service. If there’s a problem with your purchase, we’re here to help. 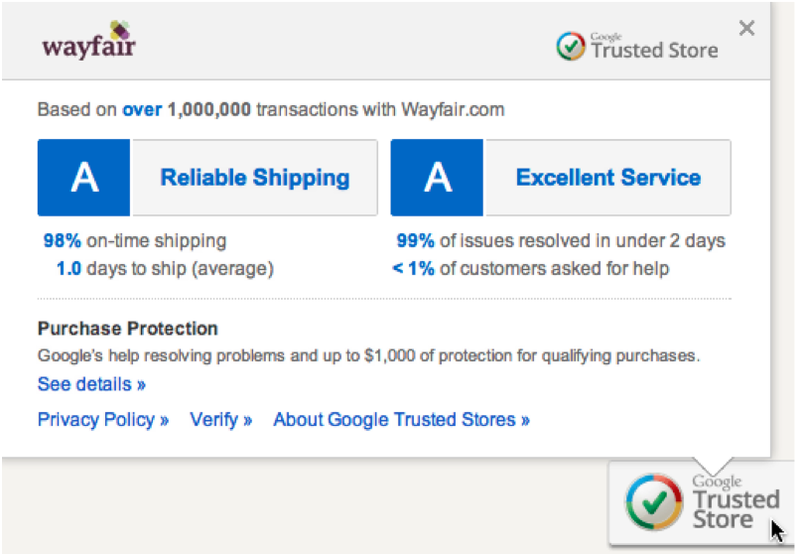 When you buy from a Google Trusted Store, you can opt in to get up to $1,000 lifetime purchase protection per shopper. And our dedicated customer service team is there to work with you and the merchant to assist in resolving the issue. Google Trusted Stores helps online stores attract new customers, increase sales and differentiate themselves by showing off their excellent service via the badge on their websites. Soon the badge will also appear on Google.com ads and in Google Shopping results. Over the last nine months of the pilot, our tests show that participating in this program can help merchants big and small. For example, Wayfair, the largest online-only retailer of home goods and one of the top 50 largest online retailers as ranked by Internet Retailer, increased sales* on its site by 2.3 percent with Google Trusted Stores. And Beau-coup, a specialty online favors and gifts retailer, saw an 8.6 percent increase*. Take a look at our merchant success stories to learn more about how Google Trusted Stores has had a positive impact on website conversion rates and average order sizes for online retailers. Google Trusted Stores is entirely free, both for shoppers and for online stores. We’re still testing the most helpful ways to display Trusted Stores information to shoppers, so you may see different versions, or none at all, while we conduct experiments. If you’re a merchant and would like to participate in the Google Trusted Stores program, please apply. Google Apps Password Sync allows Google Apps admins to synchronize their users’ passwords from Active Directory to Google Apps as they are changed. A new weekly email that delivers the most interesting news and items you might have missed from the people you’re connected to on Twitter. Now Twitter is in more languages than ever. Check for your preferred language and change your setting. Download the latest Twitter mobile apps at twitter.com/download. There’s more to Discover on Twitter.com – try out the new Discover tab. We’ve provided more details about the information we collect and how we use it to deliver our services and to improve Twitter. One example: our new tailored suggestions feature, which is based on your recent visits to websites that integrate Twitter buttons or widgets, is an experiment that we’re beginning to roll out to some users in a number of countries. Learn more here. We’ve noted the many ways you can set your preferences to limit, modify or remove the information we collect. For example, we now support the Do Not Track (DNT) browser setting, which stops the collection of information used for tailored suggestions. In our Terms of Service, we’ve clarified how your relationship with Twitter works and made a number of small changes and formatting improvements, such as new headings for easy reference and updated descriptions of our services. A reminder that Google will enable IPv6 permanently on June 6th, 2012 at 12am UTC. The countdown to IPv6 was announced back on January 17th, 2012 here. This was done for 24 hours a year ago and we did not notice any major disruptions for Apps customers. Customers with SSO IP Whitelists and IPv6 capable equipment need to ensure that their SSO whitelist configuration contains their IPv6 network segments (if applicable). The SSO Help Center article is linked here. Merchants have been asking for a fast and secure way to integrate more business applications within Magento. We’ve met this request by introducing the Magento REST API as part of the Magento Enterprise 1.12 and Community 1.7 releases. Noteworthy benefits of the REST API include simplicity, ease of testing and troubleshooting, and better performance. It allows you to manage customers, customer addresses, sales orders, inventories and products using HTTP verbs such as GET, POST, PUT and DELETE. Data requests and responses can be in XML or JSON format. REST resources are simply the entities or identities that are exposed to the developer. REST defines the identity of the resource via the URI (uniform resource identifier). Each resource has a unique URL address and any interaction with a resource takes place at its URI. The following resources are supported in CE 1.7.0.0. § Products: Allows you to retrieve the list of products, create a simple product, and update or delete a product. § Product Categories: Allows you to retrieve the list of categories assigned to a product and assign or unassign a category to a product. § Customers: Allows you to retrieve the list of customers and create, update, or delete a customer. § Customer Addresses: Allows you to retrieve the list of customer addresses, and create, update, or delete an address. § Inventory: Allows you to retrieve the list of stock items and update a stock item. § Sales Orders: Allows you to retrieve the list of sales orders and specific order information. § Sales Order Items: Allows you to retrieve the items for a specific order. § Sales Order Addresses: Allows you to retrieve billing and shipping addresses for an order. § Sales Order Comments: Allows you to retrieve comments for a specific order. § Set up permissions to operate with resources for the three different user types: admin, customer, and guest. The admin is the backend logged-in user, the customer is the frontend logged-in user, and the guest is a non-logged-in frontend user. § Register the third-party application (setting up consumer) and provide the information to the third-party application. For a more detailed explanation with sample data, check out our wiki page. As always, we welcome your feedback and are eager to help with any issues you may encounter. Please use our bug tracker and choose the Webservices API from the Category selection.